West Brom head coach Tony Pulis's record is "amazing" and he guarantees a club their Premier League status, says Chelsea manager Jose Mourinho. The Baggies have secured 23 points from 16 Premier League matches since Pulis took over took over in January. The Welshman, 57, who has never been relegated as a manager, has also been in charge of Stoke City and Crystal Palace in the Premier League. "If I own an English club, I sign Tony Pulis," Mourinho said. "It's as simple as that - he's a guarantee to achieve what the club wants." 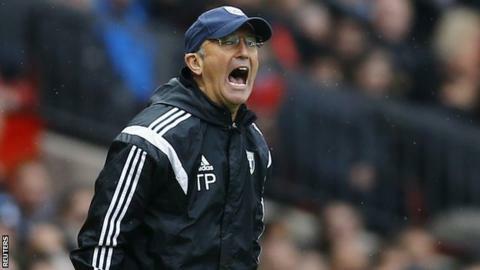 West Brom sat one point above the relegation zone when Pulis was appointed head coach on New Year's Day, following a four-month break from the game after his resignation from Crystal Palace in August. The West Midlands club secured their Premier League status for a sixth consecutive season last Saturday with a 1-1 draw against Newcastle at St James' Park. "He has never managed a club that wants to be champion, never managed a club that wants top four, he is always managing clubs that want to survive and want stability," Mourinho said before the champions' Premier League match with West Brom at the Hawthorns on Monday.